Thanks for sharing those experiences, Laurie! I remember being surprised when I went to my 10th high school reunion at how much some people had changed; the class jock was now a salesperson at a leading pharmeceutical company, the mousy girl whom I never paid much attention to was a gorgeous and well-spoken mother of two. I wonder what I'll find at the 20th! Sorry to hear about your car... but wow 450 people in your graduating class... RedJacket's (my high school) 2006 graduating class had 50 people in it! That sounds like a lot of fun, Laurie. I've had a great time at all of my high school reunions, too. Wow, what a story you have this time. Thanks for sharing it with us. My high school had almost a thousand graduating. Our class polititian ran for U.S. Vice President last election and lost. At least hehad the Stamford High School vote. 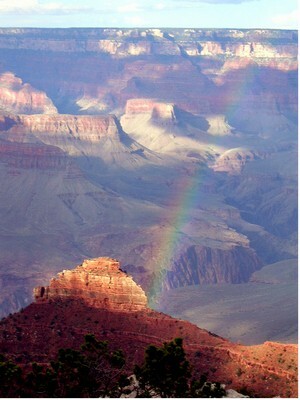 FABULOUS Grand Canyon pic. Wow! Now, that must've been a memorable day at the Grand Canyon! Beautiful. Did you do the ten year reunion? How was it different? I didn't go to mine. I was too far away from Oklahoma, having too much fun. Laurie, your comments on your 20th reunion call to mind a phenomenon that high school reunions reveal as almost no other life experience can--that time is a great equalizer and moderator. Physical and social class differences, at least as we perceived them in high school, become either less noticable, or perhaps of less importance to us in the total scheme of things, as the years go by. And the process is more or less a continuous one, at least through the 40th reunion. Classmates who were clearly dumb as hades in high school seemed strangely to have ideas and experiences of interest by the 10th reunion; by the 20th reunion, the person had clearly been doing things that seemed more interesting than what I had been doing; and by the 40th reunion, the childish differences of high school had in many instances been fully replaced by feelings of admiration and respect. These changes are invigorating and enlightening. And, they serve as a reminder that life is short and that we all have something of value to contribute to those around us. The earlier we begin listening to voices other than our own, and respecting faces other than the one we see in the mirror, the sooner we are able to partake of all that life offers, the most valuable of which is friends.